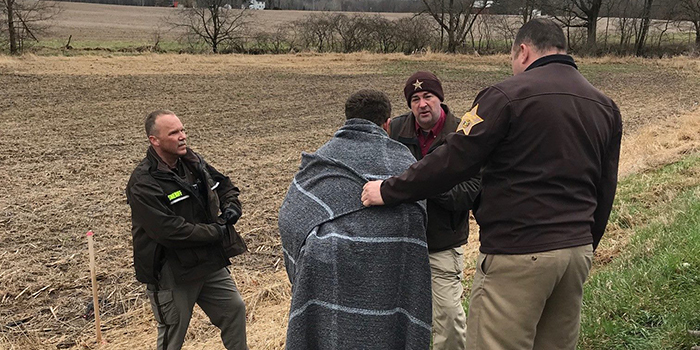 CROMWELL — It wasn’t quite “Home Alone” in Noble County this morning but when a resident near Cromwell returned home, she discovered someone on her property who didn’t belong there. At around 8:30 a.m. today, April 12, the Noble County Sheriff Department received a call from that homeowner who came home to a male going through one of her vehicles. The male was last seen carrying a backpack and running into the woods behind the residence. Deputies Todd Weber and Brandon Chordas arrived on scene a short time later. 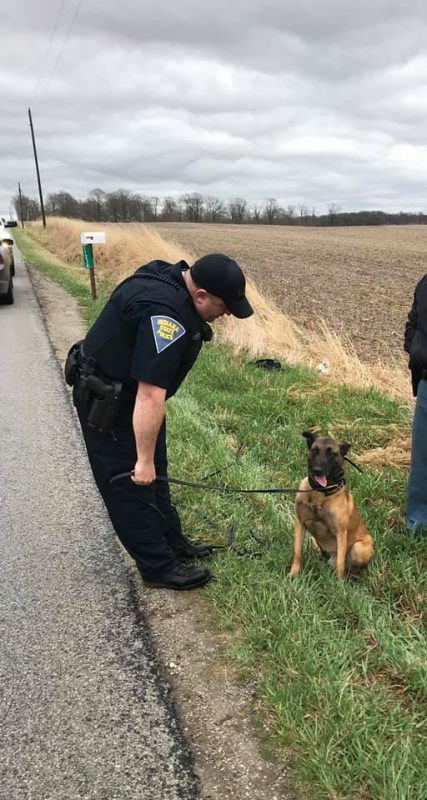 Deputy Weber began orchestrating a perimeter around the property with police units from the NCSD, Cromwell Police Department, Indiana State Police, Kosciusko County Sheriff’s Office and DNR. Both Noble County drones were deployed and an aerial search began. Indiana State Trooper David Caswell came to the scene and brought with him his K9 partner Chase. Trooper Caswell and Chase located footprints in a field west of the victim’s residence that led to a county ditch lined with trees. The K9 team tracked the suspect’s scent westbound along the water-filled ditch. Up ahead of the team the male suspect was flushed out of hiding and located by Deputy Shafter Baker via the drone. He was soaking wet and taken into custody without further incident, but without the backpack he had been seen wearing. Deputy Chordas later located the backpack which had been discarded in the water. After collecting it, he and Deputy Weber began to climb out of the ditch when they noticed some shoes submerged in the water beneath an old rusty drain culvert. It was then that they realized there had been a second suspect involved in the incident. The two officers took him into custody and noticed he was suffering from hypothermia after hiding in the ice cold water for nearly an hour. He was transported by Parkview EMS for medical treatment and later booked into jail for an outstanding warrant. Joseph Chaffins, 22, North Webster, and Charles D. Zollinger, 30, Warsaw, were the two suspects apprehended. Both are presumed innocent until proven guilty.